Our time here in India is winding down, and it’s time to review the local beer brands. Let me begin by saying that this is by no means a comprehensive review: India is a huge country, and we’ve only visited eight provinces. Also, I haven’t tried all the beers around here. For that, I believe my liver and wife are equally grateful. 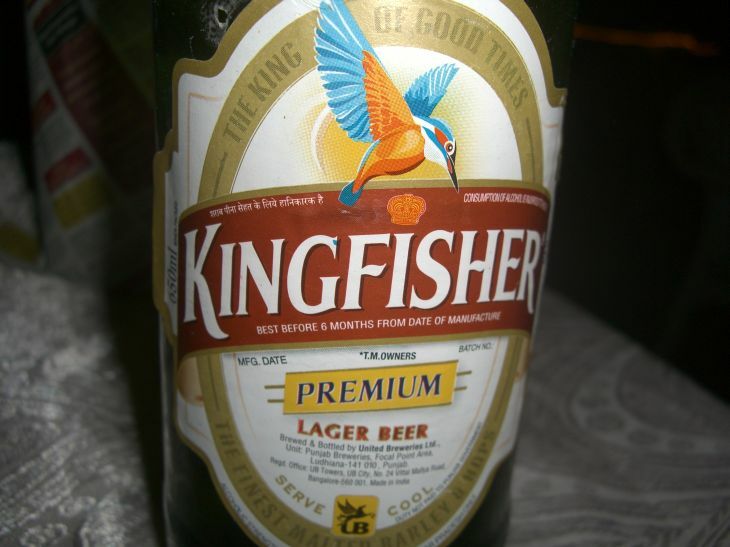 The above beer is perhaps the most well-known Indian beer: Kingfisher Premium. It can be bought in dedicated beer stores around the world. I wish I could say that this is only the starting point for the greatness that is Indian beer, but no. Sorry. This is just about as good as it gets. This Kingfisher is a well made lager with a slight consistency problem from bottle to bottle – it is all right, and I have no problem drinking it. Sometimes, it tastes a bit off: no doubt this problem stems from impurities in the water used in the brewing process. This is a Kingfisher Blue. This is where Indian beer begins to take a wrong turn: since people generally just buy one or two beers per night, they prefer STRONG beer. The Kingfisher Blue is a compromise between strong beer and good flavor: at six percent alcohol it is still drinkable, but with a malty edge that makes it more of a sipping brew than something you drink to quench your thirst. Next on the Richter scale is the Kingfisher Red. Like its blue brother, it is malty and strong. Flavor wise it tastes a bit like an ale, but at the same time it is fizzy as a lager. At seven or eight percent alcohol, one will make me tipsy and two will make me regret it the morning after. I don’t like it. 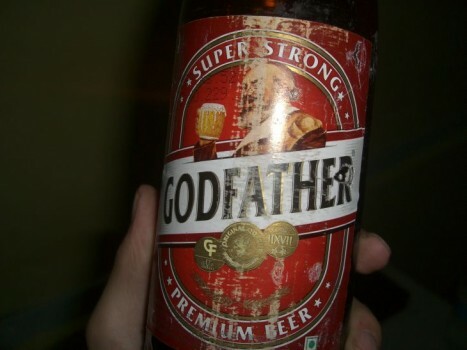 Here’s another strong contender for the award ‘Fewest Beers to Make a Grown Man Drunk’: Godfather. Taste-wise it is another malty, semi-dark story. On a cold and dark night in Ladakh, I foolishly had four bottles of this brand. I woke up the day after with a monumental headache. I normally don’t get headaches. What the heck do they put in these beers, alcohol? Yes they do, Godfather checks in at 8-10%. 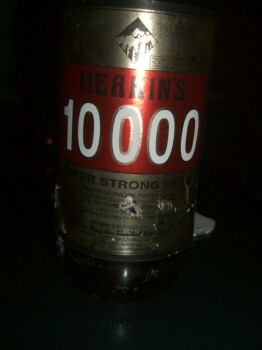 The 10000. At a fuzzy 9-13% alcohol, it doesn’t make much sense. Nor do you, after drinking a few. Unfortunately, this is the only brew in some parts of the country, and to my further chagrin it was actually not too bad tasting. Like an alcohol free beer spiked with six shots of vodka. OK, Let’s talk about some drinkables for a change. 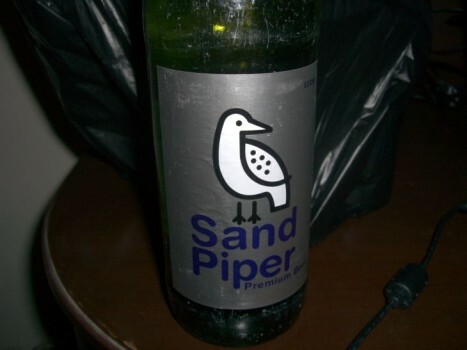 This one is called Sandpiper, and it was the only light beer we could score in the Karol Bagh district of New Delhi. It is watery and excessively hoppy, but we drank it with cherish. 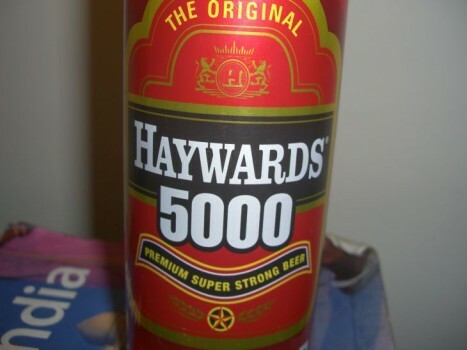 I mean, five percent, that’s like real beer! 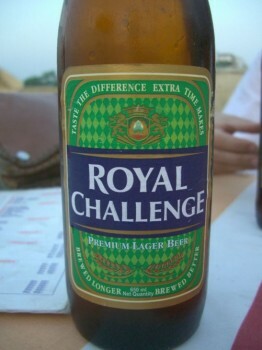 Finally, here’s my winner: Royal Challenge. It is typical that the best beer I found in India is made by a whiskey maker, and sold under a whiskey brand. I can’t say that it is a great beer: its strength lies in the fact that I drank it after a long day, sitting at a rooftop restaurant overlooking the sunset at Taj Mahal. I only found it that one time. Where were you when we needed you, Royal Challenge? 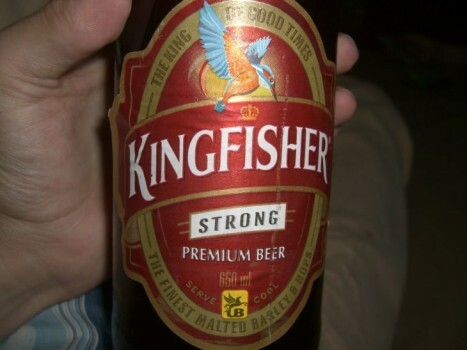 I do feel a little bit bad for writing such a negative review on Indian beer, but seriously: the strong stuff badly fits the hot and sticky climate of this part of the world. I think Mexican or Central American beer would do great around these parts, but at this time in history, India is stuck with the Thunder 10000′s and the Super Strong Godfathers. It’s enough to make a grown man sigh. This entry was posted on Monday, March 22nd, 2010 at 6:55 am and is filed under India. You can follow any responses to this entry through the RSS 2.0 feed. You can leave a response, or trackback from your own site. The first time I had a regular Kingfisher I was pleasantly surprised. 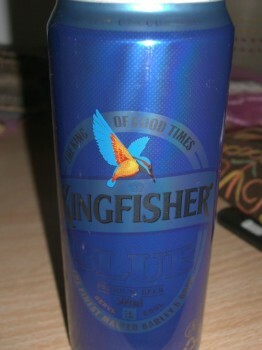 A pretty good beer, considering the other Indian brands aren’t nearly as up to the same standard. They are crap,including Kingfisher,Kings,Indian Tuborg,Indian Budweiser. Just rank!!! Give me a nice cold Lech anyday. spot on about ur comment on consistency. india is not a beer drinking nation. most of the beer drinkers want to get high as quickly and cheaply as possible. ICE beers would do well in this country. KF and RC are the only 2 local brews that deserve a mention. Fosters is made here but tasted horrible (worse than the Aussie made one which is not any good to begin with). The Fosters sold internationally is quite decent (rebranded Crown lager from the Carlton australia). Carlsberg in India was a pleasant surprise.